Tumor cells need large energy and nucleic acids to proliferate and grow. For most of their energy needs, cancer cells depend more on glycolysis. For most of their nucleic acids needs, cancer cells depend more on the nonoxidative pathway of the pentose phosphate pathway. Transketolase(TKT) is a crucial enzyme in the nonoxidative pathway of the PPP. The real-time quantity PCR was used to determine the expression of transketolase gene family in uterine cervix cancer. Transketolase activity of cell was determined by using enzyme-linked method. Cell proliferation was detected by using MTT. 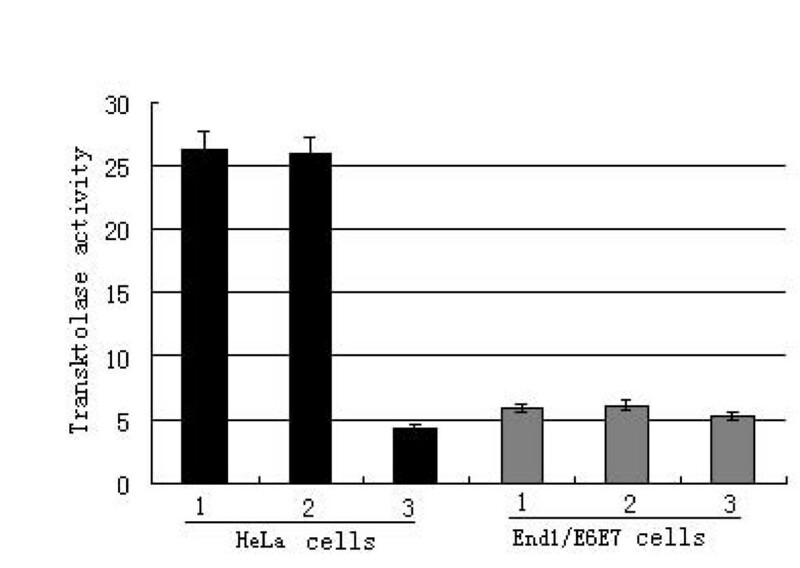 The TKTL1 mRNA was specifically over-expressed in uterine cervix cancer cells(HeLa cell line) compare with normal human endocervical epithelial cells(End1/E6E7 cell line)(P < 0.05), whereas the expression of TKT and transketolase-like gene 2(TKTL2) have no significant differences between the two cell lines(P > 0.05). Moreover, we found that total transketolase activity was significantly reduced, and cell proliferation was remarkably inhibited after anti-TKTL1 siRNA treatment in HeLa cells. The total transketolase activity and cell proliferation have no significant differences after anti-TKTL1 siRNA treatment in End1/E6E7 cells. These results indicate that TKTL1 plays an important role in total transketolase activity and cells proliferation in uterine cervix cancer. Tumor cells need a large amount of energy and nucleic acids to survive and grow. For most of their energy needs, malignant cells typically depend on glycolysis mainly, the anaerobic breakdown of glucose into ATP . Malignant cells characteristically exhibit an increased reliance on anaerobic metabolism of glucose to lactic acid even in the presence of abundant oxygen had been described by Warburg 80 years ago . But, this theory was gradually discredited. Latter Following the development of bioenergetics, recent studies demonstrated that energy metabolism in malignant cells is significantly enhanced compared to those in the normal cells, especially glycometabolism . The malignant cells maintain ATP production by increasing glucose flux because anaerobic metabolism of glucose to lactic acid is substantially less efficient than oxidation to CO2 and H2O. PET imaging has demonstrated a direct correlation between tumor aggressiveness and the rate of glucose consumption [10, 11]. It is now widely applied to human cancers because the vast majority of primary and metastatic tumors demonstrate substantially increased glucose uptake compared with normal tissue. The majority of nucleic acids for tumor cells growth are generated directly or indirectly from the nonoxidative pathway of the PPP. Transketolase is a crucial enzyme in the nonoxidative pathway of the PPP. It has been presumed that transketolase activity possibly plays an important role in the tumor cell proliferation. Boros  found that the PPP was directly involved in degradation of glucose and played a crucial role in nucleic acid ribose synthesis utilising glucose carbons in tumor cells. Coy  indicated that tumor cells which upregulate transketolase enzyme reactions can use glucose as an energy source through nonoxidative generation of ATP. Using metabolic control analysis methods and oxythiamine, Comin-Anduix  demonstrated that transketolase enzyme reactions determine cell proliferation in the Ehrlich's ascites tumor model. Ttransketolase gene family remember include transketolase(TKT), transketolase-like gene 1 (TKTL1) and transketolase-like gene 2 (TKTL2). The relative contributions of transketolase gene family to energy metabolism and proliferation of uterine cervix cancer cell have not been investigated. In the present study, the total transketolase activity was measured in the HeLa cells and End1/E6E7 cells. We found that the total transketolase activity was significantly increased in the HeLa cells compare to End1/E6E7 cells. In order to estimate whether TKTL1 play an important role in the total transketolase activity in the HeLa cells and End1/E6E7 cells, the relative expression level of each member of the transketlase gene family was determined by real-time PCR in HeLa and End1/E6E7 cells. We found that there was no significant difference in the expression level of TKT and TKTL2 gene between the HeLa and End1/E6E7 cells, the expression level of the TKTL1 gene was high in the HeLa cells compared to End1/E6E7 cells. 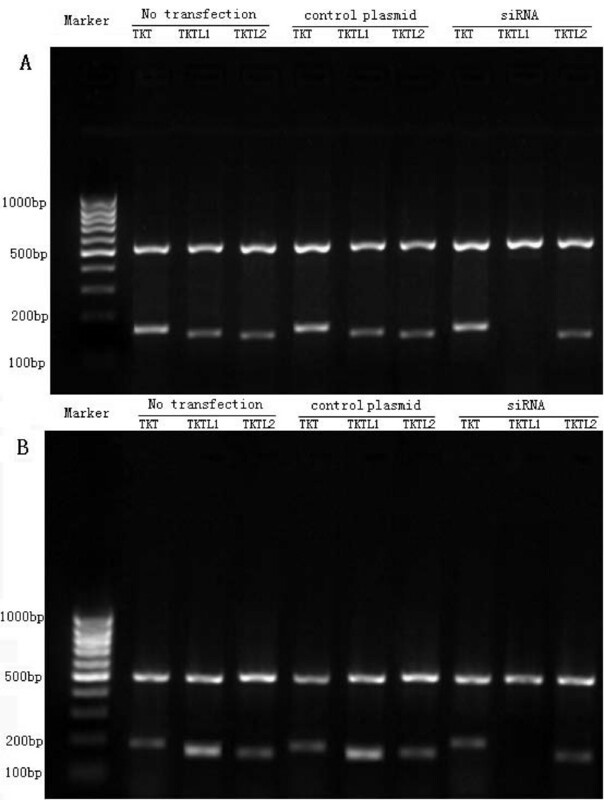 After transfected siRNA TKTL1 construct, the total transketolase activity was significantly decreased in the HeLa cells. However, there was no significant difference existed in total transketolase activity in the End1/E6E7 cells after transfected siRNA TKTL1 construct. These results demonstrated that TKTL1 play a key role in the total transketolase activity in the HeLa cells, yet not so in the End1/E6E7 cells. In order to explore the effect of TKTL1 on cell proliferation of cervix cancer cell, we transfected the HeLa cells and End1/E6E7 cells with siRNA TKTL1 construct. Our results demonstrated that the proliferation of HeLa cells was significantly inhibited, and the cells were blocked in G0/G1 stage. Whereas, there was no significant change in cell proliferation and cell cycle in the End1/E6E7 cells. So, we think that strong TKTL1 expression was correlated to fast proliferation of cervix cancer cells. Lanbein  found that strong TKTL1 protein expression was correlated to invasive colon and urothelial tumours and to poor patient outcome. Staiger  demonstrated that TKTL1 upregulation is a common phenomenon in gastric cancer and cancer of the gastroesophageal junction. Földi indicated that TKTL1 expression in 86% of breast cancer specimens with 45% showing high expression levels. Langbein demonstrated that Transketolase was more elevated in metastasizing renal cell cancer and TKTL1 protein was significantly overexpressed in progressing renal cell cancer. Our previous study revealed that TKTL1 play an important role in cell proliferation of colon cancer, hepatoma and nasopharyngeal carcinoma [14–16]. These results indicated that TKTL1 could be seen as a potential target for novel anti-transketolase cancer therapies. Hui Chen, Jian-Xin Yue contributed equally to this work.